There’s one thing that baffles me beyond measure. That is the reason dogs are so addicted to cat food. And for me, my cats also love the dog food. Why do I spend so much getting separate food for each animal when they want to eat each other’s food?? If only cats didn’t need specific proteins in their diet we could get away with getting just dog food!! LOL! Maybe someone should come up with a cat-dog food. That would be pretty awesome but I highly doubt it. Ah well, we can dream. But in the meantime, we have to figure out ways to keep our dogs out of the cat food that doesn’t involve multi-purpose foods. The essential nutrients for cats are not harmful to dogs. So when your dog eats your cat’s food it’s not harmful. Despite this fact it still can be quite troublesome in a number of ways. Even though dogs won’t be harmed by eating cat food their diet still needs a different balance of nutrients than cats or any other animal for that matter. Although this might not sound like a big deal it is. Just like if you don’t get your right nutritional needs if any of your animals don’t get their nutritional needs it can seriously affect their health. For instance, you are probably aware of the importance of calcium and bone health. But you might not be aware of the importance of how important calcium is to the nervous system and sending signals through the body. I’m not an expert in dog nutrition but you do want to be sure that your dog is getting its recommended servings of foods. Cat food is more expensive than dog food so if your dog keeps eating your cat’s food you will probably wreck up a hefty bill pretty quickly. I believe this is the case because cat food has to have more real protein than dogs since they need more protein. Cats are obligate carnivores which means that they are more dependent on protein and specific kinds like taurine. This allows manufacturers of dog food to add more fillers in to dog food that they can’t get away with adding as much to cat food. In both cases, fillers are no good for the animals but when it comes to expense it makes the food less expensive. I personally buy grain-free pet foods despite them costing more because they are healthier for your pet. 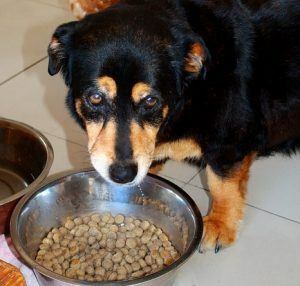 A bloated pet is not a satisfied pet which is another reason your dog or cat may seem like they’re continuously hungry. Cat food can be twice as expensive as dog food so you do want to be careful about letting your dog continuously scarf down your cat’s food. This happens a lot with dogs and cats when they like the other food better than their own. They will start to refuse the food that you usually give them because they want what they like. This can be problematic of course because you don’t want your babies to be starving. You might feel helpless to help them since their hunger might drive them to go after the other food instead of their own. Hungry dogs and/or cats can also be quite destructive as they tear your house apart looking for food to eat. Dogs can get very defensive about their food. When this happens, it is called food aggression. Like any behavior, the severity of the reaction varies greatly from one dog to the next. In mild cases, the dog might only growl but usually, the dog will at least deliver a warning snap. There are many reasons why food agression develops. It is not only an inherent trait or one that it is born with. If your dog develops food agression over his or your cat’s bowl, it can be very dangerous and even deadly. 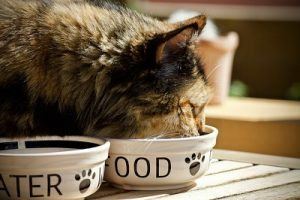 Now that you have an understanding about why your dog shouldn’t eat your cat’s food and vice versa, let’s talk about how to keep them out of each other’s bowls. Dogs tend to be a little more intimidating about their food. They’re bigger so cats tend to be more sly and less pushy when it comes to eating their food unless the dog is small of course. An easy solution to this is to take up your dog’s food bow when she or he is done. Make sure to put it in a container so that your cat can’t jump up and get it. Even if it is in a cupboard, some cats are very smart and know how to get into intricate locations like cabinets and drawers. Bengal cats are especially prone to do this as they enjoy the challenge and see it as a game. Although cats are more aggressive, dogs have the size to handle almost anything your cat will throw at it. That’s why your dog will likely completely ignore your cat if it is eating at the time of his/her invasion. Sometimes they might be more careful and wait until you’re not looking. Since cats are obligate carnivores, we tend to leave their bowls out in the open. Dogs take full advantage of this situation and scarf down the entire bowl before you ever realize it. Since dogs are larger animals, they can reach fairly decent heights by standing on their hind legs. This means that you’re going to have to figure out a good way to get your cat’s bowl a pretty decent height in the air. The bigger your dog is the higher you will need too set the bowl. The best way to get your cat’s food bowl up high in a safe, secure way is to use a tall cat tree. You want to use one that is over 5 ft, preferably closer too 6 ft high. All you need to do is be sure the cat tree has at least one high tower or a long ladder that your dog can’t climb up. Dogs are clumsy and lack the gripping capability that cats have so if you make it difficult for them, they won’t reach your cat’s food. Well, I’m glad you’re asking that because it means you really want to resolve this problem which you may not know that its not too complicated of a solution. All that you need to do is install a tall cat tree for your cat (or multiple ones if you have multiple cats). Cat trees are great for your cat for many reasons such as giving them a place to exercise and rest but in this case, we’re going to be using the cat tree to keep their bowls out of your dog’s reach. A free-standing cat tree stands on the ground. Most are pretty inexpensive but these ones are also unstable. The one that I recommend for you in this instance, however, is a wall-mounted cat tree. That’s because they’re versatile and completely disconnect the cat tree from the ground so that there is no possible way for him/her to get up. You can also get the cat bowl higher and many even come with platforms for you to put your cat’s food and water bowls. If you haven’t heard of a wall-mounted cat tree before, you are probably skeptical about its integrity and stability. While I can not speak for all cat trees, the one I stand behind is both sturdy and durable. It is also very versatile, meaning that you can customize it any way you like. It comes with posts, platforms, walkways, scratching poles, etc. so you can really give your cat an intricate cat tree that engages all of its senses. It has weight limits of 30 lbs and above depending on which structure we’re talking about so you can definitely be sure that it won’t fall off your wall. 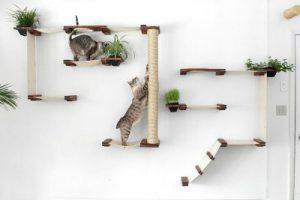 The best wall-mounted cat tree that I am talking about is the units made by Catastrophic Creations. They use solid wood, fabric, and sisal to give your cat all s/he needs and more. You will also love having a unique piece of artwork on the wall that most of your friends and family wouldn’t think is a cat tree. I don’t recommend just buying any wall-mounted cat tree because, since its free hanging, you definitely don’t want to chance it falling. If it constructed wrong, it can also cause serious damage to your wall which may be quite costly. To learn more about the CatastrophicCreations wall-mounted cat tree, you can click the button below. I hope this information has helped you. If you have any questions, comments or other feedback, you can leave them in the comments box below and I will get back to you as soon as possible. GET THE BEST WALL-MOUNTED CAT TREE NOW! Wonderful article this is. I have known people who had both these pets in their houses and they had the same sort of problem. And lots of homes with both these pets can benefit from this article. It not just gives you the solution but also tells you why it happens. I’m sure it is going to help lot of people. Thank you for the article. I’m glad you found value in this information and thanks for referring this information to your friends. I think it is very important to maintain a peaceful balance in the home regardless of what pets you have. In my house, each pet has its own bowl and they don’t go in each others bowls…most of the time, lol! Of course dogs will do that but I usually correct them since I tend to feed them while I’m doing something in the same area. I have a puppy but no cat since I’m such a dog person, but I do have a friend with both a dog and two cats. Many people don’t realize that this food issue happens between dogs and cats far too often. I know that my puppy, like most others, are ready to eat pretty much anything that resembles food! After reading these tips, I’m confident I can share this article with my friend so they can start looking into the wall mounted cat tree and doing whatever else necessary to help the situation. Hey Ryan! Thanks for sharing and I’m glad that you found value in this information!